Oriental White-eye is a small bird from the Zosteropidae family. This species has also various subspecies depend on the region. Photo 1: Exif- f/5.6, 1/125s, ISO-400, 500mm, Nikon D7100, 200-500mm f5.6E. Date- Mar 19, 2016. Location: Pampadumshola National Park, near Munnar, Kerala. These birds are good in doing various acrobatic poses. The above photo is an example for that. It was hanging from the twig of a shrub in an interesting way when I clicked it. Appearance: There is a white ring around the eye. The primary color is yellow with a slight green shade. The under parts have white color. These birds are small in size, only a tad bigger than the sunbirds. The male and female look alike. Other characteristics: These little and active birds are usually found in groups and feed mainly on flowers and insects. So they are often found around flowering trees. They generally stay on the branches most of the time and rarely come down. The main breeding season is around April. Other larger predator birds pose a threat to them. 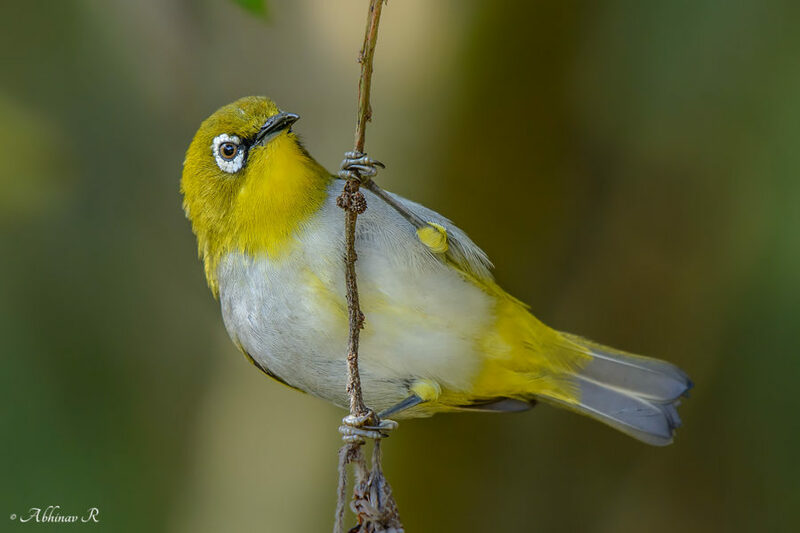 Distribution: Oriental White-eyes are distributed widely in South and South-East Asia. Their main habitat is forest edges. Family: Zosteropidae (family of white-eyes).